Live a Life of Dangel With a Peugeot 4X4! 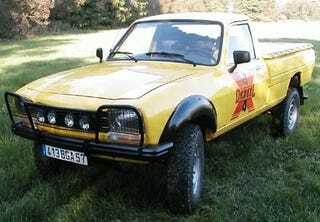 Inspired by yesterday's Peugeot Econoscope post, French Project Car Hell Poster Child Franzouse figured we might be interested in the 4x4 conversions performed by the French company Dangel on Peugeot 504 pickups. So take a look here,here, here, and here for some four-wheelin' tough Peugeot truck action. Save Gas The French Way: Econoscope!